The book’s title is: “Teach Your Kids to Code to Turn Them into Billionaires.” – although it is not exactly what I wanted. Aimed (by editorial staffs) at the office workers (non-engineers) with elementary school/junior-high school children, I tried plain and comprehensible description of what the heck are computers, programming and algorithm. 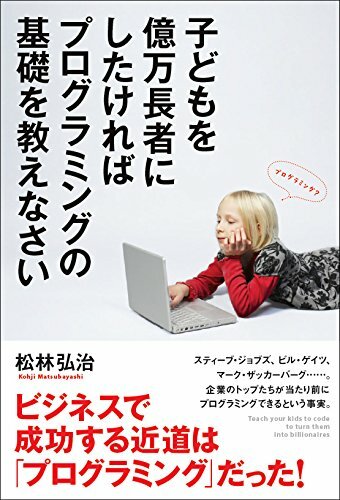 Kids programming schools (one of the hot topics these days in Japan) also mentioned in the book. Primary theme is “Kids and Programming”, and therefore this is not a very “techie” book – for me it’s a kind of the book of raising kids, like “let’s appreciate the joy of programming with your kids”. Unfortunately enough, the title itself sounds very agitating (result of the editorial team’s idea who tried to figure out how to attract more audience). However, I can say I did my best to write every sentence very sincerely and faithfully. I spent all of my new year holidays for writing this book, hoping I could convey the enjoyment and excitement of “coding/programming” even for kids and non-techie adults. Please pick this book up and examine the contents just in case you found it at your local bookstores. and tagged こどプロ, プログラミング教育, 子どもを億万長者にしたければプログラミングの基礎を教えなさい, 똑똑한 엄마는 국영수보다 코딩을 가르친다.